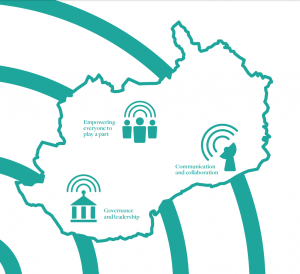 The IWA’s Smart Region project has explored how the Cardiff Capital Region City Deal could use smart technology to improve the lives of the people who live and work in the region – and at the same time strengthen the region’s economy. We wanted to capture this learning so it can be translated to other regions of Wales, and the UK. The project report, Our Smart Region, proposes six steps to accelerate the introduction of smart technological approaches and to move the CCR toward becoming a smart region. Smart has its origins in computing, as an acronym for Self-Monitoring, Analysis and Reporting Technology. Smart is now commonly used to describe a wide range of networked and data-driven technologies which detect conditions and respond to them. Based on automated analysis of data these systems will automatically adjust their function – or the function of other systems – to improve performance. If smart technology is already making our lives easier in small ways by providing us with new information to make better choices, imagine the difference smart could make if delivered at scale to improve our public services, our infrastructure, and our economy. We believe by taking a smart approach to developing the region, the potential benefits of the Cardiff Capital Region City Deal could be far more significant and lasting than its stated economic aim of a minimum 5% rise in GVA (Gross Value Added). We have engaged across the region to uncover the great work that is already happening. Some of the work in the region is world leading, such as Cardiff’s SmartPark App which is the largest deployment of parking sensors in Europe. Other schemes are helping people to share and develop digital skills, like the Wales Co-operative Centre’s Digital Heroes. In discussions we have had with stakeholders, it is clear that many do not know how to engage with the City Deal. This includes businesses, academic bodies, healthcare providers and community groups. With no clear routes for communication and engagement, we are concerned that the number and variety of ideas brought to the table will not reflect the diversity, talent and expertise within the Cardiff Capital Region. Smart is a global movement, so we looked around the world to find inspirational best practice to learn lessons and inspire the City Deal. We’ve highlighted the work of Toronto, Australia and the app Waze to give an appreciation of the varied ambition smart cities are showing, and the effect community support can have. Build a Digital Skills and Employment Platform to up-skill the regional workforce. You can read the project report here. In order to catalyse the kind of collective vision required to drive a Smart Region, we need to provide spaces for the region’s stakeholders in which they develop shared priorities and collective momentum. It’s clear that if the Cardiff Capital Region is to achieve its smart potential, the conversation is only just starting. You can find information on our proposed next steps here. Become a member of the IWA today and help fund important projects that are shaping Wales’ future. Join now from just £2.50 a month. As a member, you’ll also receive regular newsletter updates on the progress of our projects.